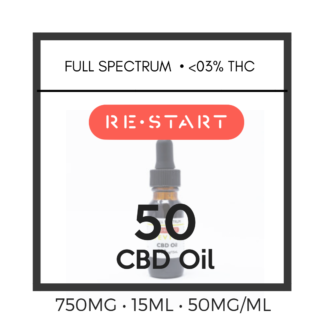 RESTART CBD is Changing the Way you Manage your Personal Health! Raw Hemp Oil full of cannabinoids like CBD, CBG, CBN, and CBC (including <0.3%THC). All of these cannabinoids help to work together to offer your body a more rounded effect. Made from CBD rich hemp flower organically grown in Colorado using Co2 extraction. Tests slightly higher in cannabinoids like CBN or CBC. Raw honey, plus a formulation of terpenes to offer you all around support. Additional CBD Isolate for more strength! A safe, organic product that is Non-Psychoactive. Each and every bottle is grown and processed with the same standards as the last guaranteeing quality and assuring potency wit third party lab testing. High Strength Full Spectrum CBD! When taken sublingually, RESTART CBD will do the trick to assist in creating the homeostasis your body needs to “feel better” in all areas of you life. When tasting our CBD Hemp Oil you will get the rich flavor of hemp with a hint of honey, and natural plant terpenes that add a bit of a zing! For our pure CBD isolate hemp extract that has been filtered to remove any THC compounds, try one of our Replenish, Recover or Relax products. CBD Hemp Extract Ingredients:C02 Extraction for our Full Spectrum Raw CBD Hemp Oil and CO2 Extraction for our CBD isolate – (with 1800+ mg cannabinoids per fluid ounce) Organically grown Raw CBD Hemp Oil, CBD isolate, raw Colorado honey, real terpenes and organic MCT oil.